In a release, the Ministry said fogging operations in St Vincent and on Bequia and Union Island will take place daily from today, commencing at 5:30 p.m.
Today, Tuesday, fogging will take place on the mainland in Diamond/Kingshill Area, Bonhomme and Lower Stubbs. Tomorrow, Wednesday, August 13, fogging will take place in Victoria Village and Carapan and on Thursday in Enhams, Mc Carthy and Glamorgan. Home and business owners in the named areas are required to keep their windows and doors open to allow the fog to take effect. 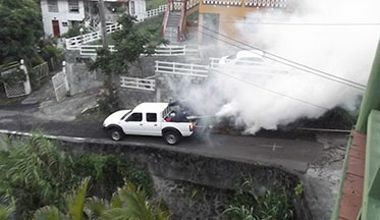 Parents and guardians are advised that their children are not to run or play near the vehicle during fogging operations.